You know how the saying goes…if you fall off a horse, you’ve got to get straight back on again. Well, it’s taken me 2 years but I have held another “Mad Science” party for my son’s birthday and I have survived. Two years ago, this would never have seemed possible. That party – twelve 7 year old boys in my house (first huge error), one mad scientist and two shell-shocked, utterly horrified parents – ended with me bursting into tears of sheer relief when they all left and only narrowly avoiding an extended stay in The Priory. The only word I can think to describe that party is apocalyptic – “Lord of the Flies” South-West London style. It was a seminal moment in my child-rearing – the moment at which we lost total control. The boys were in charge and it wasn’t pretty. I genuinely think I suffered with a sort of post-traumatic stress disorder after that party. One thing was certain – never ever ever would I hold a child’s birthday party in my house again. I have kept to that. The other thing I thought was certain – never ever would I wish to hear the words “mad” and “science” in the same sentence let alone combined with the word “party”. Somehow my resolve weakened on this. That brings me to today – “Mad Science” party 2. Not content with twelve 7 year olds, this time I upped the stakes and we had twenty four 7 year olds (all boys), one mad scientist (female) and four potentially shell-shocked, utterly horrified parents (yes, this time, I shared the annual burden of the birthday party). Before the party, as I contemplated my idiocy in agreeing to endure another two hours of utter hell, I tried to work out what sort of person would choose to endure such a party again at a significant financial cost with absolutely no visible upside. Clearly, I am a lunatic. Well I survived and you know what….it wasn’t actually that bad. Admittedly the memory is already fading at the edges thanks to the indecently large glass of wine that I am currently attacking like some sort of slightly deranged, dehydrated dipsomaniac. The mad scientist certainly earned her money this afternoon and I am fairly sure she is reconsidering her career choice (she’s just completing her teacher training) after 2 hours with 24 boys, a load of goo, dry ice, bunsen burners, potentially lethal chemicals and a non-launching rocket. I am also certain that being a mad scientist and spending 2 hours trying to control a roomful of crazed 7 year olds must be one of the most effective forms of contraception on the market. I know I probably shouldn’t say this but I don’t believe I’m alone – children’s birthday parties are an ordeal, something to be endured, an annual burden. But they are a necessary rite of passage and I remember (just) the excitement I felt in the build-up to my birthday parties when I was a child. Of course I wouldn’t want to deny my children that excitement and celebration. Two things bug me though: firstly, children’s parties were simple affairs when I was a child – some games, home-made cake and a party bag full of nothing much. Nowadays, we are expected to shell-out hundreds of pounds on entertainers or hold our parties in ever more exotic venues, buy in the cake (gone are the days when an 8 inch round with chocolate buttons on it sufficed; no, now kids expect an entire football pitch replete with favourite team and realistic-looking icing turf) and a party bag brimming with the latest must-have toys. Time to collapse in a post-party heap. Ticked that box for another year. Conquered my fear of “Mad Science” parties. Yes, it has been a good day on the whole. Today I want to give shout out for three unsung heroes who day in, day out, fulfil professional obligations which go far and beyond the call of duty. Of course it is only right that we should praise our firemen, policemen, nurses, doctors etc for all the sterling work they do every day to ensure our safety and good health. However, I want to highlight three professions which remain under the praise radar but for which as far as I am concerned being in the line of fire is all in a day’s work: chiropodists, children’s party entertainers and dental hygienists. Now I actually quite like my feet as body parts go – not that I spend much time contemplating their loveliness. However, as much as I like my own feet, I can categorically say that I don’t like anyone else’s feet and that there are a lot of feet out there which could have their own starring role in a horror movie (“Psych -toe”, “The Toe -men”. “The Exorblist(er)”. 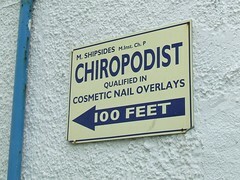 This brings me to the very underrated occupation of chiropody. These people selflessly put themselves in close proximity to other people’s feet every hour of every day. They not only have to look at other people’s feet but they have to touch them too. In fact it is a job with sensory overload – seeing, touching, smelling (but not tasting – thank god for small mercies!). Imagine a job where bunions, verrucas, and ingrowing toenails are your bread and butter (as it were). These are the unsung heroes that keep the nation on its feet. I guess dental hygienists fall into a similar bracket in some ways – looking after the health of a nation. There are some differences though which perhaps make them even more heroic than our chiropodists. Firstly, whereas a chiropodist might come across a well-kept pair of feet may be once a day, I do not believe that one could ever say that the mouth and teeth of anyone over 35 is pleasant to survey. Secondly, although chiropodists do inflict a level of pain which may make a visit a little uncomfortable, no-one likes going to the dental hygienist. How depressing it must be to be viewed with such horror and fear by everyone you see, knowing that you will almost certainly encounter blood, shrieks and swearing at every appointment. 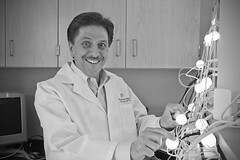 But dental hygienists are tough types – they are working for the higher good of mankind (or at least for their teeth). Yes, they too are, in my opinion, unsung heroes. So to my third group of people – children’s party entertainers. My eldest son had his birthday party last weekend and all things considered it was a bearable affair – definitely better than two years ago which nearly resulted in an extended stay in The Priory for his mother. 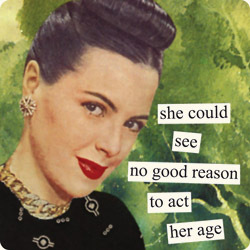 The thing is I only have to suffer the birthday party once a year – I get 364 recovery days in between parties. Not so the children’s party entertainer. No, these courageous people willingly put themselves in a room of up to 30 children every single day and attempt at best to entertain them, at worst to maintain some semblance of control. Have you ever encountered a more unappreciative audience than a bunch of kids? How on earth do they put up with the noise levels? How do they pretend to be happy the whole time? How do they manage to pretend for 2 hours that even the most charmless children are a joy to be with? I take my hat off to them – this is a herculean task which they carry out uncomplainingly and for the most part dressed in ridiculous costumes. So let’s hear a bit shout for my unsung heroes of the day. I’m sure there are many other unsung heroes out there – do let me know who your unsung heroes are.